Hello and happy Full Moon! I hope this finds you well and riding out these cosmic waves….yep today is the second consecutive Libra Full Moon! As always, if you want to know more on this Full Moon, please feel free to check out my Soulstrology blogs which have all the details, customized rituals, mantras, channeled messages and of course Soundbaths to enjoy. I have a new podcast episode up which is an Alchemy of Relationships x Empath diaries episode all about energy vampires….you can listen here or on iTunes or Spotify, just search Alchemy with Ambi. Onward here are my high fives from the last lunar cycle…. I admire Michelle Obama so much and have devoured her autobiography which has made me weep, smile, at times cringe/shudder and struck such a chord in my heart. I am sure you have all heard about it and I have to say it lives up to the hype. It is SUCH a good read and has just made me admire, and indeed now adore, this wonderful woman even more. It’s been a true highlight of this last month and I am sad I have finished it as I will miss ‘hearing’ her voice and energy through her words. What a wonderful woman! My former student/mentor now friend and Soulstrology colleague Lexie Rollet, launched a podcast called Being a whole person and when she asked me to be a guest I readily accepted. My episode is called ‘Living in alignment’ and perhaps because I trust and respect Lexie so much and am so comfortable around her, I was truly myself, more vulnerable and open than perhaps I usually am and it felt really good. She is such a gem, a total old soul, and her astrology is a wonderful mix of practical wisdom and deep spiritual intuitiveness. I am always so happy to see others rise and follow their passion and purpose and proud to in some way play a small part in their process and it was an absolute highlight of my month to be on her and her co-host Rebecca’s podcast. I hope you will check it out! In my last podcast episode the Alchemy of Authenticity, I talked about how I had stopped strategizing so much with my brand and business. Like most of you, I am ambitious and have many goals which require growth and expansion, but I have intuitively felt that strategizing and pushing wasn’t for me. Trying began to feel like forcing. And given my 2019 mantra was joyful abundant flow I didn’t want to try too hard as that felt like forcing and the opposite of my mantra! So I haven’t. In the meantime, well, let’s just say that it seems people have noticed little ole me plugging away and there are lots of exciting things that have come my way, none of which I have sought out (literally people have come knocking!) which I will share in time to come. This high has translated as me trusting the universe more and feeling validated by my decision not to push so hard! Aligning not hustling. Flowing not forcing. And still diligently working away. It all pays off! The hubs and I love to get away for a long weekend every three months. There is something about getting out of the city which just does our souls good. The last time we went away was just after Christmas so it has been almost four months and I was feeling it! #firstworldproblems I know ;) Last weekend we went to Santa Barbara and had the most glorious few days. We stayed in the cutest little hotel with an ocean view room and enjoyed daily long walks on the beach, soaking in that salty sea air and really grounded and celebrated after what has been an eventful few months (more on that in time to come). Good food, fun times with friends and a total reset for us both. Plus we now know that we ought not to let our weekend trips slide to every four months…we are already planning our next mini getaway! If you follow me on Instagram you will know I post a bit more of my home/personal life in my stories rather than as posts and that I have been delighted that the gorgeous tree outside our place has blossomed over the last month. The greenery surrounding our place is one of the reasons we moved here last September. I was pretty upset when a month later it was tree trimming time. More like tree butchering time! I was reassured that the tree would blossom again in Spring and so it has. It reminded me (kinda silly I needed the reminder given the work I do with Soulstrology, but ya know, we all need reminders!) of the importance and power of seasons. Of accepting each season for what it is and being in it, trusting that seasons are finite and trees and life blossoms once again. It makes me so happy that this is a ‘high’ from this month as it reminds me that in spite of multiple businesses, big personal shifts and living in this crazy town called La La land, I am still enjoying and indeed thrilled by the simple pleasures in life…in the end the little things end up being the big things.. Anyway, that’s my high fives from the last month! As always I hope you enjoy them and I hope they inspire you to take note of what your highs are. The more ‘highs’ we notice, the more ‘highs’ we will get to celebrate! Wishing you a wonderful Full Moon and weekend. Hello and happy almost Full Moon Equinox! The energies are intense at the moment as we prepare for a new season and chapter of life. This last lunar cycle has been a powerful one for me in many areas with lots to celebrate as well as of course my alchemy highs. A big part of my own journey to wellness has been to take care of my health and my physical body. Over the years I have struggled with many different autoimmune and hormonal issues and I have worked hard to get to where I am now where I find myself healthier (embracing my forties) and more aligned than several years ago. I swear I even look younger now than in my mid thirties when my illness was at its peak! So much of my journey has been external of course, with diet, supplements, herbs, acupuncture, exercise and lifestyle etc, but ultimately my recovery and creating true wellness and alignment has come from within and has been led by my inner voice and intuition. I think we women often forget our own wisdom, our inner knowing and our personal power. If we can reclaim this, we can heal ourselves, and also help lead and heal our world, in our own unique way. I am going to be sharing so much more on my journey in time to come but for now I wanted to share this book on women’s health which changed my entire perspective and taught me so much. I hope it helps you as much as it has helped me. It’s fair to say I love pink! I am such a geek and love order. I put this down to my #virgorising – ha! Every day I have a little daily to do list and I record not only what I do (personally/professionally) but also what I spend (and where it comes from – which account, cash, debit, credit etc). I find this simple practice of using a daily journal SO powerful. It helps when I need to look back or track something, but it also helps me maintain a clear head. I feel a sense of daily satisfaction which comes from ticking off items on my to-do list, knowing what I have spent (even if it does sometimes shock me, -gah!) and knowing what remains outstanding and I still need to deal with. I swear it helps me sleep better as well as run multiple businesses and juggle my personal life. I love using these beautiful, high quality, affordable journals which last for ages. This one is both suitably girly (I will be a pink lover forever) as well as feeling suitably aligned with this new season of Spring. I highly recommend this practice if you feel yourself getting spun out, overwhelmed, forgetting things or feeling disorganized. It takes just a few minutes each day and will make your life run so much more smoothly, plus if you have a beautiful journal to do it in, it makes it all the more enjoyable! As well as loving hard on my redheaded hubbie, I have also developed a love of ginger in the last couple of months. I decided to reduce my caffeine intake even more and rather than wake up and have a green tea I instead wake up and make a hot ginger water with this organic ginger juice which I am obsessed with. Sooo good for your digestion, a great way to start your day and also tastes amazing when added to La Croix! With all the rain and cold weather which is only just beginning to shift here in LA, I have had bad allergies, the stuffiest (and snottiest!) nose and have been hibernating indoors a lot. Clearly my blood has thinned and I am no longer the hardy Brit who can tolerate 30 degrees and under! As many of you will know, I am a bath lover and I do LOVE good old plain Epsom salts which are usually my choice of bath treats but I also love a good bubble bath now and then (who doesn’t?!). This Epsom salt bath foam with eucalyptus has been a life saver over the last couple of weeks when my sinuses have been blocked and I have had a foggy head. I highly recommend using it if you are a bath lover who like me loves Epsom salts but also loves a few bubbles, and perhaps you too need a bit of a eucalyptus hit to clear your sinuses and head cold! So there’s my high fives from the last lunar cycle. I hope they might help or inspire you in some way on your alchemy journey or even just make you take a moment to recognize some of your highs from the last month. I am changing up the publishing of my monthly high fives to align with the Full Moon. As the Full Moon is the highest point of the lunar cycle with la luna at her biggest and brightest, it is also a point at which we can reflect on the highs of the last lunar cycle since the last Full Moon. So here are February 2019’s high fives…. As many of you may know, much of my work has been (and indeed still is, albeit in a different way) that of a teacher/mentor/coach and guide of sorts. As well as life coaching and mentoring, I have had a few reiki and astrology students. It is a humbling and heartening journey to be that of a teacher and one which has given me immense satisfaction over the years and even more so in the last few months. One of my former astrology students Lexie Rollet of Alexandria Astrology has flourished in a way that I always knew she would but is nonetheless delightful to witness. She has really stepped into being a teacher and guide herself, with her astrology offerings and now a podcast which explores what it is to be self-employed. Lexie was in full time employment when our mentorship started and a year later is very much self-employed and embracing the entrepreneurial path. For me, as a teacher, it is pure joy to see former students and mentees flourish and step into their light, their power and their true path. And what is even better in the case of Lexie is that she is contributing to my Soulstrology subscription with insightful posts. As Soulstrology grows I am feeling definite tribe vibes and am now having the vision of some of those I have taught and mentored over the years becoming part of Soulstrology. It’s amazing how life unfolds and I feel a deep sense of gratitude and awe for the burgeoning relationship with Lexie and for the vision of how things may play out with her and other students. A true high in all senses! In my ongoing quest to live a cleaner, healthier, non-toxic life, I have been trying to clean up every aspect of life, to what I eat, as well as the products I use on my body. I absolutely love this seven free nail polish which has a lovely subtle sheen (add two coats if you want a deeper pinkish color) and this five free non toxic uber glossy top coat which gives you the look of gel nails, without any of those nasty toxins! Looking good and groomed is great, but not at the cost of putting toxins into your body and thanks to these polishes you can enjoy pretty, healthy, toxin free nails! A few years ago whilst recovering from foot surgery I read this book and it CHANGED MY LIFE. It made me realize how much of a people pleaser I was and how poisonous that was to my life - both personal and professional. I recently felt the need to re-read it and it really made me re-think how I spend my time and energy. It made me really stop and take stock before agreeing to do something, or blindly following up on a get together. It stopped me from bending over backwards and contorting myself in the process. It also made me appreciate the people I love the most and redirect my time, my love, my energy towards them. I cannot recommend this book highly enough and if you excuse the continual profanity which I know turns some people off, the message is powerful and indeed life changing. A great one for those of you who like me perhaps have struggled with boundaries and saying NO. A lot of the time I have rushed to take supplements with the best intention that they will improve my health without actually looking carefully at what exactly is in them and where they come from. I recently switched out my daily multivitamin to these whole raw food vitamins and have felt a real difference ever since. It just feels cleaner and more ‘right’ that I am getting my vitamins from whole foods without any nasty additives or more in them. With LA experiencing unusually inclement weather (raining cats and dogs as we say in England) and a lack of sunshine, I have also been making sure to get my daily dose of vitamin D through these drops. So many of us are unwittingly deficient in Vitamin D as we cover up and/or avoid the sun (or don’t live in a sunny climate) and so too, many of us simply do not get all the vitamins and minerals we need for optimum health. Getting cleaner with my vitamins and making sure my Vitamin D levels do not drop in winter have proved key to me avoiding getting run down or overly sick (I did have the sniffles for a few days there) which has been an unexpected and pleasant high of this last month. 5. Our one year podcast anniversary and we are on Spotify! It’s been a year since we started our podcast. I say we, because Jon is an integral part of this podcast and we truly are a team on it and other ventures. One year in I feel as though I have grown so much as a result of this podcast and as well as opening my heart, it has proved such an expander personally and professionally and brought me so many new opportunities which I am excited to explore. It seems fitting that on our one year anniversary we are now hosted on Spotify as well as of course, Soundcloud and iTunes. Hopefully this will make it easier for you to tune into the latest episode! So these are some of my high fives from the last lunar cycle. I hope some of my highs can help you to create more highs and alchemy in your own life! Hello lovely souls and happy Friday and almost Solar Eclipse! In case you’re needing some New Year inspo, please check out the latest episode of my podcast which is all about setting up your 2019 for success and happiness. If you live in LA or are visiting and need some New Year cobweb clearing out, come join me tonight at Wanderlust for my first Soulstrology Soundbath of 2019! Onward to my five highlights from the last lunar month…. Eclipse season always brings change. And not always the rug pulled underneath from you or big happy yay kind of change. Sometimes the changes are more subtle, more of an internal shift which plants the seeds of change on the physical plane. Whether the changes are internal or external they have usually been bubbling under the surface and eclipse season simply comes and shakes them out of their hiding place. I have felt at a crossroads professionally. I didn’t have a podcast a year ago and my Soulstrology Membership was still relatively new and Soulstrology.com was a mere seed. A year ago I had a lot less on my plate work wise, but the truth is that over the last six months or so I have felt like something had to give, that I couldn’t keep things as they were. I knew what it was but didn’t want to face the reality of what needed to happen because I didn’t feel ready to make the necessary changes. But, as many of you will know, one of my favorite saying is, ‘You can do anything, but not everything’. This week all the feels bubbled into a decision and I decided to phase out the mentoring side of my business this year, freeing up some of my time, still allowing me to provide individual sessions for people, but without the time commitment that my mentorships require. It has been truly bittersweet. Bitter because my Mentees feel like my people. They are my people. Yes it is a professional relationship but it is also a deeply personal one. And although I have no doubt we will be in each others lives, professionally and personally for years to come, I know this marks the end of an era, and endings always make me a little sad. It has also felt uncomfortable in practical, financial terms, as it is willingly turning down tens of thousands of dollars worth of annual income. But sweet because I know in my heart it is the right thing to do, as ultimately it will allow me to help more people in a different way that better serves my lifestyle. My podcast has been a huge expander, Soulstrology.com is almost birthed. And I am ready for a new chapter and to birth newness into my life, both personally and professionally. I am excited and curious. I honestly have no idea how things will play out and life will unfold but this decision felt right in my gut, and I always trust my gut. PS. If you are reading this and you were interested in being mentored by me, you can still apply by the end of January for my final Mentorship program for the foreseeable future and I am still going to be offering individual sessions in 2019 and beyond so feel free to reach out! 2. Vegas Baby, celery juice style…. To celebrate eighteen months of marriage and the year anniversary of our church wedding (we eloped six months before that and consider that our true anniversary, but ya know, it’s always nice to have multiple anniversaries to celebrate!) we headed to Vegas, which is where we eloped in June 2017. We ended up staying off the strip in Summerlin and had the most glorious long weekend. It was really fun to do Vegas differently and see the other (amazing) side of the city. Think hiking, horse back riding in the canyons, dining out and generally decompressing. It was an amazing way to end 2018 which was a full on year for us with a new job, move and lots of change (and some challenges). Now, as you guys may recall I jumped on the good ole celery juice bandwagon a month or so ago but I wasn’t having it regularly. But in the last half of December I was more consistent and I have to say, I really noticed a difference. In my energy levels, skin, digestion, you name it. I was a little concerned about going away and missing my celery juice (*insert suitable crying face/cringe emoji here*) and so my hubba of a hubbie suggested I make it differently using this travel friendly blender. And hey presto….I am SO glad he suggested this as I usually struggle with digestive issues when I go away and eat outside of my normal diet. I ate tons of gluten, sugar, some dairy sneaked in and I enjoyed wine every night yet my stomach was fine….I am crediting my daily celery juice with keeping inflammation at bay, but I am also glad to be back and eating normally again. I can guarantee you that travel friendly blender will be accompanying us when we go to Europe over the summer so I can maintain my celery ritual! I read a fascinating article on the origins of the term being basic and I will confess I have been accused of being basic before…For wearing Uggs, leggings and horror of horrors - an Abercrombie sweatshirt - I didn’t realize it was such a fashion faux pas! I get that I wasn’t looking like a glampuss but I just wanted to be comfy and the sweater was eleven bucks on sale! My style may have changed somewhat in the last few years but my love of Uggs has stayed firm. I tend to wear things until they really are on their last legs and I will admit that my Uggs were a bit scruffy. Both my Mum and my hubs (separately) helpfully said I looked homeless in one of my ‘casual’ outfits with my battered Uggs as my footwear of choice. Anyway… I decided it was time for a change and switched it up to these ‘same same but different’ Uggs which are actually much more in my general color palette and I think will hopefully withstand the wear and tear (and LA grime) to look better for longer. In choosing to purchase Uggs again when I get so much flack from my entire family about this choice of footwear was my way of saying, I am doing ME and I do not care what anyone else says! If I am basic, so be it! As I get older, I am less and less concerned with what others think and more concerned about what makes me happy. And this basic b*tch is very happy with both my lovely new Uggs, and life! 4. Human Design deeper dive. I had a ton of questions after our reading and decided to book a follow up session to dive deeper. A little like astrology there is only so much you can download to a person in an hour so the follow up was necessary for my curious mind who wanted to really align further with my design type. All I can say is WOW. Amanda is an incredible channel who is not only deeply intuitive but speaks and deconstructs your unique design in a way which allows you to really understand the gems that will change your life. As we embark on a New Year (with the Human Design New Year around the corner!) we are all looking to create changes in our lives and manifest our desires but some may feel stuck. If you want to get unstuck, gain clarity and understand how much easier life can be once you align with your design, I highly recommend booking a reading with the lovely Amanda. I loved Kevin Kwan’s book Crazy Rich Asians and devoured it in days. I dragged the hubs to see the film and we both loved it. But the books, oh my. His writing transports me into a different world and I feel like a gawping fly on the wall who actually knows his characters. The footnote have me snorting with laughter. The Washington Post sums up the second Kevin Kwan book perfectly, ‘As frothy as the egg whites on the sort of cocktail you should drink while reading Kwan’s books….Highly entertaining’. Anyway, I hope you’ve enjoyed reading about my high fives from this last lunar month! Wishing you all a happy solar eclipse and a beautiful lunar cycle ahead. It’s feeling very festive in my household as our Christmas tree is up and twinkling and that beautiful fir tree scent is infusing our home…..happy days! Speaking of happy days, here are my high fives from the last lunar cycle…..
Not all news needs to be read Another joyous feature I discovered on my newly updated iphone was that you can control which sites are accessible on your phone. Now I am gonna confess (not spilling all the beans as yet because I am saving the full details for a podcast episode) that there is a particular news website which I (as I suspect like many others) have had a strange fascination/hate relationship with but ultimately have had an addiction to. Whereas others may find their phone issues are with social media, my biggest foe was this website. I would find myself scrolling it far far too often, when in stuck in traffic (my bad, I know), waiting in line, and more. I knew with my rational mind that it was toxic and how I would feel when browsing this site and afterwards was enough of a sign, however addictions are such that they keep you, well - addicted! So, I banned the site from my iPhone and iPad and now I can only look at it when I am on my computer. The result? I look at it at most for ten minutes a day now, if that. I’ve realized that I wasn’t even that interested in it in the first place, I don’t miss it after all and it was just a bad habit that I needed to break. Yes by putting in a seemingly dramatic boundary like banning it from my phone, but hey, it worked! And the result? A much happier, energetically lighter and brighter, higher vibing moi! Celery juicing and bone broth Yep, I jumped on the celery juice bandwagon and nope, I haven’t been totally consistent with it but I have to say I like how it makes me feel. I am listening to my body much more carefully these days and honoring what it tells me and it told me to try this celery juicing out. And so far, so good. My body has also been craving hot broths and specifically bone broth and whilst I usually buy mine from Erewhon, this month I started making my own. My body is happy. I am happy. And when I eat a Kobe burger (with the most delicious toasted brioche bun, yep, sometimes I do cheat and eat gluten! ), sip on a delicious cocktail, or a glass of my favorite red wine, or munch on donuts and homemade banana bread I am also honoring my body. I’m all about eating healthy but I also feel balance is KEY to a truly healthy life (and I am talking mind, body, soul healthy). And for those of you who follow me on Instagram where I post my daily alchemy on my stories, I have heard you - recipes are coming in the New Year! Supplement shout outs. In my ongoing journey to be healthier I have found that no matter how well I eat I need supplements to maintain certain mineral levels in my body and be in optimum health. I highly recommend these calcium and magnesium tablets which I take at nightime with a cup of steaming reishi cacao. I also take these fish oils (usually late afternoon, I like to give certain supplements time to be digested properly before consuming others). I also love this immune boosting selenium. So that’s some of my highlights from this last lunar cycle. As always, I hope you enjoy reading about my high fives and I hope they help inspire you to check in on your highlights from the last month and keep track of your own alchemy journey. Hello lovely ones and happy slightly belated New Moon! What a full lunar cycle it has been….soooo many highlights, so much goodness, but at the same time I expended so much energy too. I took the last week off social media and largely offline and took some much needed time to myself and intend to do lots more of this as I am starting to wind down for the holidays early this year…I am planning almost three weeks ‘off’ and am starting to wind down now rather than in five weeks time when I usually find myself absolutely exhausted and overwhelmed. I say ‘off’ because when you are self-employed you are never truly off. With three separate businesses (one of which is Soulstrology which has had the longest gestation period and I hope will be birthed by the Winter Solstice) and new projects brewing for 2019, the truth is that I have a lot on my plate. I feel a podcast episode on this topic of juggling things, taking time out and the importance of rest coming soon….speaking of podcasts… my latest podcast episode is now up! Another in the Alchemy of Manifesting series and all about the power of privacy as a manifesting tool. You can listen via Soundcloud, iTunes (search Alchemy with Ambi on the app) or via my website homepage which always has the latest podcast episode up. Living the process in Laguna and Wellspring desert deliciousness! I was away two weekends in a row for two very different but equally amazing weekends away. The first was for a weekend experience curated by the wonderful Robyn Berkley of Live the Process at the incredible Hotel Joaquin in Laguna Beach. 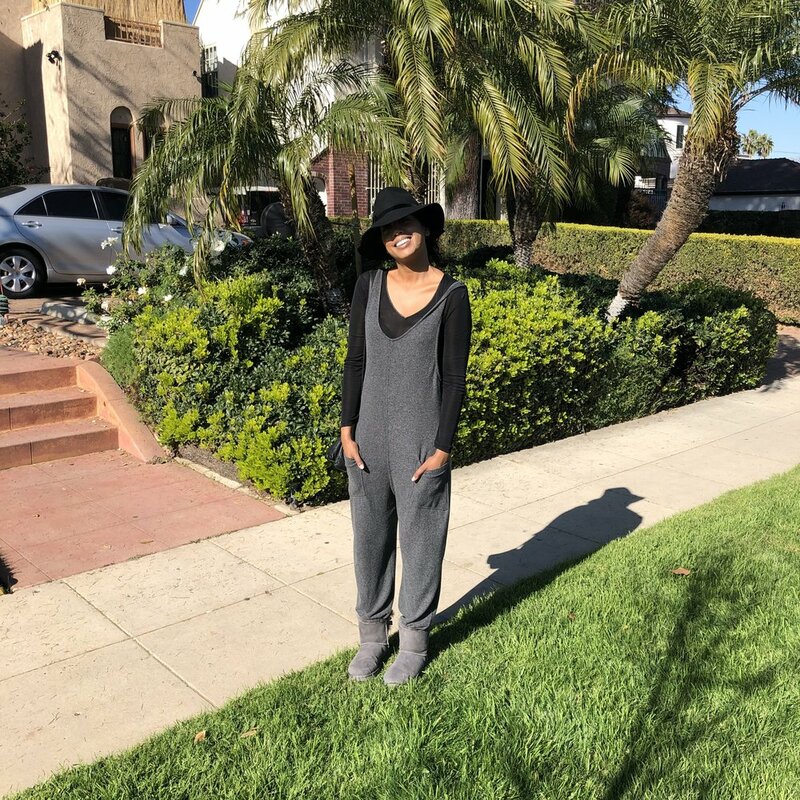 My first time at Laguna Beach and I was utterly spoiled to stay at Hotel Joaquin….the weekend was full of pampering and renewal and connecting with some amazing souls. Chalk Board wrote all about it here and they are probably much more articulate than me at describing the wonders of the weekend. I can’t wait to be back at Hotel Joaquin, and this time with my hubs! But life is always full of surprises..
P.s I cried at the end of the last Soundbath of the weekend as I walked around with my chimes sprinkling musical fairy dust on all the attendees and beaming them with reiki. I was so utterly humbled at getting to do this work and so touched by all the love in the room… it was all just a bit too much, in the best possible way. This life. This love. This light…I hope the above picture gives you even a teeny taste of the energy….aaahhh. It’s been almost a year since the devastating fires in SoCal which caused insane air pollution and had this Virgo rising in panic mode cleaning black soot from our blinds on a daily basis. Did you know that according to some studies air pollution is now a bigger threat to our health than tobacco smoke?! In my quest to live a healthier life, last year, prompted by the fires and the crazy smoke, I purchased this air purifier and allergen remover which has changed our lives. With three different settings and a ‘turbo’ ability, you can choose what to target to make sure you are breathing cleaner air. I also got this humidifier which is a must for those of us who live in the desert where things can get, well, a bit dry! I have had nosebleeds before during certain times of the year and that is no bueno. This humidifier and the air purifier changed our home environment, our sleep and dare I say, our lives. Breath is life. So make sure what you breathe is giving you good life! I think it’s fair to say that you all know by now that I am English and as a Brit, there is nothing more than I love than having a cuppa! At anytime of the year, regardless of the climate, I love a good cuppa. And I love all tea. A good english breakfast is a morning must, but I also love white tea, green teas, caffeine free teas, loose teas. You name it, if it is tea, I have probably had it and love it and will offer it to you if you come over! Years ago I discovered this kettle which is approved by this Brit tea lover. It is BPA free (important!) and has a number of different settings so whatever type of tea you want, this kettle will make it for you! If you are into tea, you need this kettle! I just had to replace ours after years, so thought it was a good opportunity to tell you all about it in case you want to get your cuppa on, BPA free! At this time of year I tend to miss my family a lot. It’s my birthday next month and of course Christmas and Boxing Day, which I don’t think is celebrated here in the US but is one of my fave holidays back home. Think eating Christmas leftovers in your pajamas and watching movies and napping. Heavenly. We aren’t returning for Christmas this year as we have just moved home in September and need to settle and be grounded here but we are hoping for a Spring visit to spend some time with my family. In the meantime when I really miss my mum I like to light these incense sticks. They take me back to my childhood and remind me of our prayer altar at our family home. It’s amazing how a smell can transport you back in time or to surpass time, space and motion and help you feel your loved ones. It is far from a hug and hang out in person, but I know that is coming…. It’s almost Winter here in LA and I have realized how my blood has thinned because I am sat here freeeezing when it is in the sixties! Honestly, I do not know what has happened to this hardy Brit who spent several years living ‘up North’ in the UK and survived several properly cold Winters. I am an LA lady now! But as the seasons change I do notice my skin understandably changes too. At the moment my hands and lips are just dry….dry, dry, dry. And this was exacerbated when I was away for Wellspring navigating hotel air conditioning and desert dryness. Led to unattractive dark blotches and chapped lips and dryer than dry hands. Yuck. I am slathering on this lip balm and hand cream - which comes in this mini travel version which you can slip in your handbag. Almost two weeks later and my lips are luscious again (my hub’s kisses may have helped..) and I am not embarrassed to shake hands with anyone for fear of them feeling as though I am sand papering them! So that’s some of my highlights from the last lunar month and products I am using to help me create alchemy in my life. I hope you enjoy reading, perhaps some of the products I share can help you and perhaps this post may inspire you to check in on your highlights from the previous lunar cycle. Remember, what we pay attention to, grows, so focus on the good stuff! Here we are on the cusp of the dark night of the Moon when the moon is barely visible to the naked eye and the sky is almost a clear canvas, setting us up for the New Moon. At this time we can feel an emptiness, a void of sorts and some people report that they find the dark moon period more emotionally challenging than a Full Moon because of that feeling of emptiness… so if you are feeling those feels, that’s why! To access the Member only blog for the New Moon in Libra please either log in if you are already a Soulstrology Member or become a Soulstrology Member - you can read about Membership and its benefits here. Hello lovely ones and happy October! I am full of beans because it is my favorite season and time of year - Fall, as my lovely Americans call it, or Autumn, as I grew up calling it. Onward, here are my high fives from the last lunar cycle…..
I’m in the 1%! In Human Design…. Check her out and let me know what your design is and how you are working with it, I’d love to hear from you! One of his few ‘rules’ for our marriage/home was that he wanted a phone free bedroom and I did not adhere to this for the first year of marriage. I used the excuse that we used my phone as an alarm clock (which we did, after I threw out his annoying digital alien green eyes light alarm clock). When we moved (I am sooooo in love with our new home by the way, I feel like I have fallen in love with LA all over again!) we decided we wanted to start afresh and reset ourselves in so many ways. This cutesy little vintage style alarm clock has changed my life. I have started to turn my phone off. Not airplane mode. Not ‘only’ looking at it a few times. But OFF. Out of the bedroom, out of the lounge, in the office, OFF! Most evenings I turn it off between 8 and 9.30pm and it stays off for 10 - 12 hours. I don’t turn it on again in the morning until I have completed my morning ritual (if I am doing it, I don’t do it everyday, I see how I feel and adapt accordingly) or I am ready to look at it (at least 45 minutes after I wake up). I cannot tell you how this has changed my energy levels, focus and general well being. I recommend this clock because even though it’s not super fancy, it is cute, it is very affordable and doesn’t have an annoying tick tock sound or a sleep disturbing light, but it does have a little button you can press if you need to shine a backlight to check the time. Major win. Major shift. I love supporting friends and I love that I get to shout out talented friends and their creations. My friend Amina Akhtar wrote this book which is getting all the rave reviews. I bought it and I LOVED it and I cannot recommend it more highly. On this note I have to say I take pleasure in spending some of my cash to support others efforts and achievements. Don’t get me wrong, I love freebies (who doesn’t?!) and I am grateful for them and will shout them out if I genuinely love them (and ONLY IF). But when my friends work hard, I have zero expectations or entitlements to freebies and am more than prepared to part with some cash to support their work. Having known Amina for several years I have witnessed some of her journey to get to publishing this book and am so proud of her and cannot wait for the series to come out! As this season of life gets fuller I find myself having to say no more these days and for a recovering people pleaser it isn’t easy. But it is oh so necessary. I had to re-listen to my own episode on Boundaries and the magical manifesting power of NO (lol, the irony!) and remind myself of how saying NO meant saying YES to myself, my family and my passions. So I started to say a loving but clear NO. To people and situations. And the Universe responded witha big YES in many other areas! To be discussed further in time to come…until then I did say a big YES to being a guest on Spirit Guides Radio and the Superficial Magic podcast. I got to connect with some new wonderful, wise women and discuss all things boundaries, relationships and empaths. Check em out, they both have a ton of fabulous content which educates and entertains. Win/win right?! So that’s my high fives for this last lunar month. As always, I hope you enjoy reading and hope some of my high fives might help you in your life or act as inspiration for you to try and make some shifts for this new season. Hello lovely ones, I hope October is treating you well thus far…. So here we are, on the cusp of Venus Retrograde which begins officially this Friday October 5 2018 at 10 degrees of Scorpio and ends on November 16 2018 at 25 degrees of Libra. Hopefully you will have all read the Venus in Scorpio - a prelude to the retrograde blog (posted September 10). The last few weeks may have given you some insight as to what to expect from this particular Venus retrograde. To access the Member only blog for Venus Retrograde please either log in if you are already a Soulstrology Member or become a Soulstrology Member - you can read about Membership and its benefits here. So here we are in the season of Fall with a new month around the corner and power player Pluto turning direct this Sunday September 30th at 18 degrees of Capricorn. As you all probably know by now, Pluto has been in Capricorn since 2008 and has been wreaking havoc in all things Capricorn related in the wider world and in the Capricorn ruled parts of each of our lives. To access the Member only blog for Pluto Direct please either log in if you are already a Soulstrology Member or become a Soulstrology Member - you can read about Membership and its benefits here. Happy (almost) Full Moon lovely people! These Soulstrology Scopes are mantras or affirmations of sorts to help guide you to work with the energies of this Full Moon. Read for your Sun and Rising sign if you know it. To access the Member only Soulstrology Scopes for the full moon in Aries please either log in if you are already a Soulstrology Member or become a Soulstrology Member - you can read about Membership and its benefits here. Monday’s Full Moon falls at 2 degrees of Aries with the moon opposing the Sun at 2 degrees of Libra and takes place at just before 8pm PT on September 24 (adjust for your timezone). As always, check where Aries rules in your unique chart and specifically where you have two degrees of Aries and any planets between zero and five degrees of Aries as they too will be triggered by this Full Moon. To access the Member only blog for the full moon in Aries please either log in if you are already a Soulstrology Member or become a Soulstrology Member - you can read about Membership and its benefits here. Sun protection - because I can't spend the entire summer napping on a tree in the shade, as tempting as that sounds! June 2017: Go for it! Hello lovely ones and welcome to June 2017! This month the cosmos offers us jewels, but in order to retrieve these jewels we need to take action. As many of you will know the Soulstrology theme for the Gemini New Moon last week was ‘going for gold’ and each of us pursuing our highest ambitions. The theme continues in June with the cosmos asking each of us to really hone in on what it is that we want and then pursuing it with enthusiasm. In other words, just going for it! With both Mercury and Venus finally out of retroshade and with cosmic giant Jupiter going direct this month, we have the support of the zodiac to take action without any muddling retrograde mix ups. Each of us has unique dreams and ambitions. As we change, so too will our goals. But sometimes we keep our most cherished hopes, wishes and dreams stifled within. We may talk about or reflect upon them from time to time, but we don’t actually take steps to manifest them. We may feel that they are unrealistic, or even impossible. As a result these unfulfilled dreams lie dormant inside of us, where they are neither dead nor alive. But dreams don’t come true unless we do something. Soulstrology says that this month we need to go within and connect once more to our dormant dreams. And then we need to take action, even a teeny tiny step, to help co-create our dreams with the cosmos. There are of course no guarantees in life. The future is promised to no-one. We don’t always get what we want and not every dream is our destiny. Nonetheless, we know that fortune favors the bold. The truth is not every goal or dream will manifest. Use the power of Mercury (the ruler of this next lunation) to think about your deepest dreams. Journal and get clarity on the steps you need to take to create the opening for the jewels that June can bring. As usual I will write blogs about the new and full moons. In the meantime, here are the key cosmic dates for your diary. June 4: Sun in Gemini squares Neptune in Pisces - tough but ultimately productive aspect, a reality check. June 29: Mercury in Cancer opposes Pluto in Capricorn – tense, emotional aspect, watch out for conflict around communication and power struggles. May we all have the courage to take action upon our deepest desires and may these efforts be rewarded. I am wishing you all a glorious, jewel filled month.